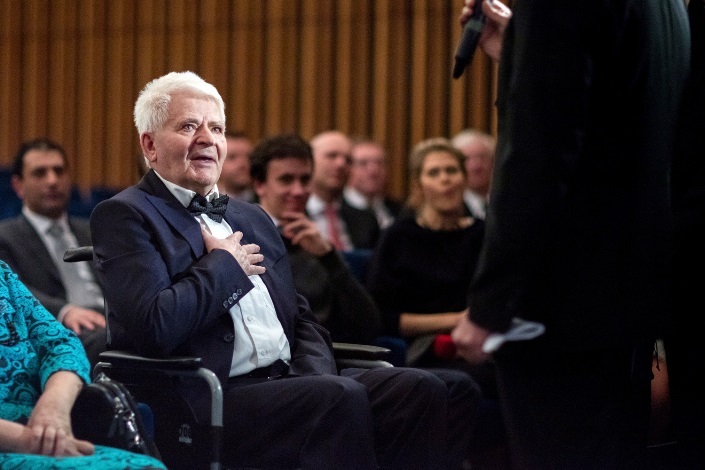 Boris Spassky: Two strokes in ten years. The first happened in San Francisco, where I was giving a chess lecture. The operation went well and I could move like a knight again. The second time struck in Moscow. For now I’m holding on, alive! But my left arm and leg behave badly. They’re on strike. But my noggin works. Do you go out at all? Sometimes I travel. Last autumn I was at the premiere of the film Pawn Sacrifice in Berlin. And in Moscow I recently celebrated the centenary of the birth of Paul Keres – a big figure in chess. I set off for distant lands – on Khoroshevskoe Highway (a street in Moscow) they’ve built a new scientific and technical library building. So I have to manoeuvre across the whole board… Plus I’m waging a war! I’m divorcing my French wife and being left high and dry. I’m losing all my property! Yes. Maybe I’ll manage to save the chess archive. My wife is stubborn. My French son as well. No-one says “no”. The formulation is, “Come and take it yourself”. But with my health that’s a tough manoeuvre. I’ve already come to terms with losses being inevitable. A matter of technique. But on the other hand, no lives are being lost. In 2012 I had to flee France, so let it all stay there. At least I’m alive! You mentioned you flew to see the premier of Pawn Sacrifice. I didn’t fly. I got to Berlin by train. That’s better for my health, but the film turned out to be weak. My memory retains it all – I’m still alive. While there they were playing, acting. Some kind of surrogate! You’ve got an amazing way of expressing yourself. The actor who played you – did he get anything right? Also a miss. That guy turns his eyes, but Fischer was different! His height, gestures, behaviour… There’s no intrigue in the film and the main thing is missing – how I agreed to continue the match. I could, after all, have put an end to it all and left as the winner! Were you right to stay? In hindsight I think I did it in vain. I should have let Fischer get what he wanted. He’d begun to concede the match! Imagine we’re boxers. If one of them says, “that’s it, I quit” you accept it! But I refused. Did he realise he was conceding? And more! He didn’t turn up for the second game. The arbiter started the clocks – and handed Fischer a loss. Before that match he hadn’t won a single game against me. You appeared for the third game – and your first loss. Yes, that gave Fischer enormous confidence. He realised he could fight. Did the Soviet officials insist that you left? Yes, they ordered it! The President of the Sports Committee Sergey Pavlov spoke to me on the telephone for half an hour. He directed me what to do: “Write a protest against it and fly home…”. But I insisted I’d play! A fool, of course. After all, the match went beyond individual interests. It seems you were confident you’d beat Fischer? I felt sorry for him. I could see that the guy was going mad! I had a good relationship with Bobby. It’s Korchnoi who needs to hate his opponent to play normally. I’m absolutely not like that. Sitting opposite me was a child who was losing his mind. What kind of hatred could there be? But a sportsman should have awakened in me, someone for whom victory is more important than anything else. I didn’t come up with any tricks – in contrast to Fischer, who came out with all kinds of random statements. 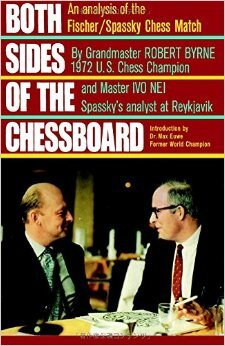 He criticised the Icelandic organisers, FIDE President Max Euwe, the Soviets. If the birds stop singing in the Bay of Reykjavik, who’s to blame? Spassky! Later I realised that all of that provocation was deliberate. You’re talking about the colonel, who led the US Chess Federation? No, the colonel was Edmondson, while Cramer was a businessman. An incredibly loud-mouthed one! I missed another point – before the third game there was a scene between the Chief Arbiter Lothar Schmid and Fischer. Bobby yelled, “Hey, shut up!” What kind of talk is that?! What did that have to do with you? I simply needed to get up: “Bobby, that’s enough for today. We’ll play again another day!” I’d met with Euwe before that: “Boris, you can leave the match at any moment – I understand that decision. Bobby has conducted himself terribly. A challenger has never allowed himself something like this before…” For the FIDE President to speak so openly is remarkable! He had a bad opinion of Fischer? In 1975 Euwe got his revenge – he took away the World Championship title and gave it to Karpov without a match, but that’s already a different story. Did you meet Lombardy afterwards? About three years ago in Dresden at a tournament for grandmasters over 75 years old. Lombardy turned up there. They told me what he said about the match with Fischer: “We wanted to unsettle Spassky at all costs. He shouldn’t have a clue what was going on…” At the same time they were afraid, above all else, that I’d have enough and slam the door. They were balancing on the edge. I think they knew what was happening in my team. I took as one of my seconds Iivo Nei from Estonia. He turned out to be an American spy. He conspired with Robert Byrne, who ran the chess section of the New York Times and would be his co-author for a book on the match. Nei was aware of all our ideas – and the Americans waited for information from him. If I’d decided to leave, Fischer’s team would have been informed about it immediately. Fischer was woven of paradoxes. A loner, he threw down a challenge to the world order. Innocent people died on September 11th, but he supported the terrorists, bringing down fire on himself. For the Icelanders he was still a hero. They weren’t afraid of America. They threatened that if Fischer, a citizen of their country, was arrested, then all of Iceland would go to prison with him. A man with a tragic fate. I understood that when I first saw Fischer. 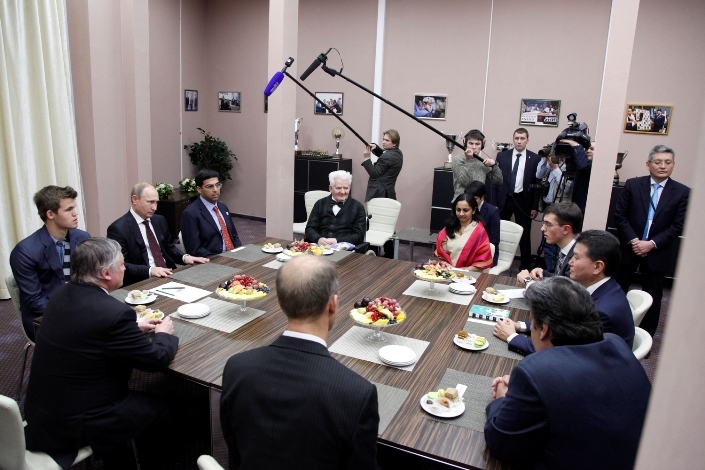 In Moscow. He was 15 years old. A lanky kid who arrived with his sister Jane. In the club on Gogol Street he played blitz with Petrosian, Bronstein, Vasiukov and Lutikov. I sat down at the board opposite him myself in another couple of years at the tournament in Mar del Plata. Your last conversation with Fischer? We discussed which move is stronger: e2-e4 or d2-d4? We concluded it was the second, since the pawn is defended by the queen. Bobby phoned himself. I never bothered him by telephone since I knew he’d start again with his talk about his “Fischer” chess. I didn’t approve of that idea - there are too many variations - but he stuck with it. Do you still dream about Fischer? Yes, it happens. He was ruined by kidney problems. He needed to have two straightforward operations, but Fischer refused. He didn’t trust the doctors and feared they’d cut him up on the table. He also tried to dissuade me. Were you at Fischer’s funeral? I couldn’t get there – my French wife objected. Later, when I went to Reykjavik, I laid flowers on his grave. Fischer gave directions in advance – where he should be buried, what music should play and who could carry him on his final journey. There were three chess players on that list – Andor Lilienthal, Lajos Portisch and myself. Near a path with a commemorative plaque: “Here met the Althing – the first Icelandic Parliament”. Incidentally, that’s the first in the world, established in 930, before Rus’ had converted to Christianity. The music he chose was Green Green Grass of Home by Tom Jones. I sang it when we were walking around Budapest. Fischer picked up on it. I didn’t realise he knew the words of many pop songs. In Zagainov’s book I read – 1968, Kiev, the match against Korchnoi. A quote by you: “I understood on the very first day that I’d win, because Korchnoi arrived with his wife while I turned up with two blondes. I was choosing, fussing about it, and it had a good influence on me. It’s necessary to have some outside stimulation”. There were blondes. Perhaps not two, but more. But as for deciding during the match who would inspire me to victory… No. At the time I really did immediately realise that I’d beat Korchnoi. Do you want to know why? I got some friends together, took a car and raced to Yeysk, on the Sea of Azov. There I took a look at Korchnoi’s latest games – all of them with lots of moves! You really can’t see? Instead of winning a game in 40 moves he spent 140! The quality of each move was low! Discovering that, I calmed down. I stopped preparing. I went fishing in the sea and left. I won the match quite easily. There were no tricks there, but then in Belgrade Korchnoi accused me of “hypnosis”! From some point onwards I hated him. 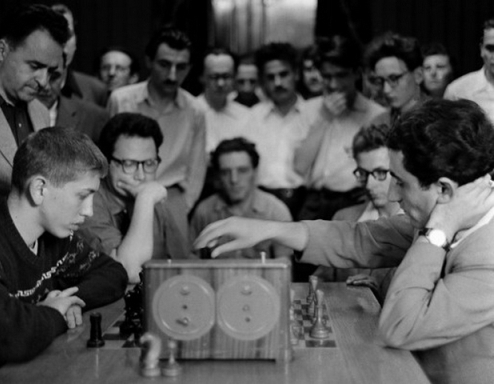 For the first time Korchnoi was confronted with an opponent who was emanating hatred. Usually it would all be from his side. How did you manage to get so worked up? It’s very simple – Korchnoi started to interfere with my play! When my clock was going he’d pull faces. Snort. The most disgusting thing was that he took to scraping his nails on the table. Some people can’t stand that sound. When he was going to offer a draw Korchnoi would call over the arbiter and pass on the draw offer through him, though I was sitting opposite – say whatever you want. His behaviour really upset Tigran Petrosian. Petrosian and him loved to kick each other’s legs under the table, they say. Vasiukov also said that Korchnoi kicked him. After the match I asked Tigran what had gone on with Korchnoi. He responded: “Korchnoi? Kindergarten! But KARPOV – wow!” Anatoly wasn’t yet World Champion. Botvinnik didn’t rate Karpov at first, but when did you realise the scale of his talent? It was crying out at you! You just can’t compare him to Korchnoi. Above all, there’s a colossal difference in chess talent. Korchnoi’s not becoming World Champion was merited? 100 percent. He never had any individuality at all. In his memoires Korchnoi wrote about you: “We started the match as friends and ended it as enemies”. That’s how it was in Belgrade. Since then we haven’t kept in touch. Who labelled you the “chess Pushkin”? Is it true that you know “Onegin” by heart? Are you one of those grandmasters who remembers all his games? No, but if I give a simul on 35 boards I can reproduce any game from the first to the last move. Occasionally people would try to trick me. You approach and suddenly: “You’re mated!” “Just a second. Now I’ll show the whole game”. It immediately became clear where they’d cheated. Have you played against amateurs in trains or planes? There was a case. When already a grandmaster I was returning to Leningrad from Moscow. There’s a girl sitting in the wagon. We’ve barely set off when a man rushes in. He asks, “Shall we play chess?” “Maybe, but you don’t have much hope of winning”. “We’ll see about that”. We set up the pieces, and I start to cut him up! Into tiny pieces. Did your success impress the girl? Does chess exist in your life today? No, it’s more interesting at the board. I set up the pieces and recall my own games. I’ve got a magnetic pocket set. It’s convenient as the pieces don’t fall. I’ve also started a huge analytical project. I’m writing about my chess career. I hope I manage to finish it. Spassky: "I still look at chess with the eyes of a child"